The "Take It!" came from almost being startled to find this, in the driveway, in front of the hotel, as I returned to my car from having made my visit to the lobby of this newly remodeled property. I use the word "startled" as, upon my arrival and getting out of the car, I was so focused and intent on accomplishing my purpose of the visit, that I did not look closely at my first steps after getting out of the car. The position of the tie could have been obscured from my vision by the bottom of the open car door as I arrived, thus saving me from stopping to photograph this before taking care of my mission. To continue, upon my return to the car, the tie was visible and two photo's taken. The photos taken were using the positioning cues learned from previous shots where, bricks, blocks or some other delineated surface items or materials were used. I have included both shots for your review and contemplation. The After Take: This was lots of fun. The title for this conjured a different picture for most, before actually being shown the photos. A "Tiedown" as one word describes a completely different object. I usually go into a lengthy description or explanation of what someone is about to see, then having given the viewer the advantage of having formed a mental picture - go ahead and show them the photo. I have found this sequence give ease in the comprehension of what is being viewed when it is presented. In this instance, as the subject was not complicated, I added some fun. What seemed to quickly ensue was the imagining of how this could have found its way onto the driveway in the first place. 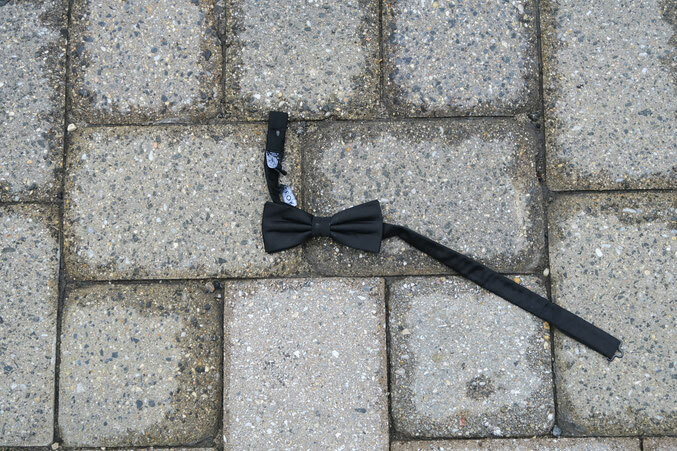 It is usually a part of formal wear, and not taken off and on other than possibly having the wearer, take it off just before getting into a vehicle as a form of relief before driving home or to where they were staying. "The Party is Over" was another title contemplated - lol. I hope you enjoyed joining me in the surprise of this find. Is that glue or something on the tie? Brings new meaning to the term, Highway Beautification. It does look like it was set down intentionally rather than just dropped. 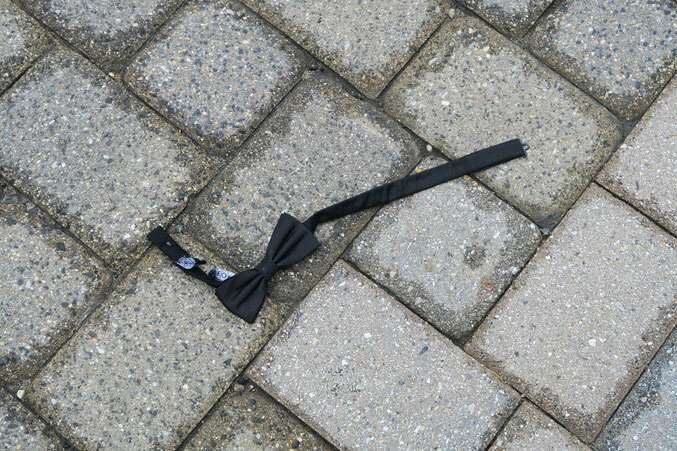 I wonder who the sidewalk takes to prom. Awww poor guy! I hope that wasn't an expensive tie he lost. I know sometimes those things can cost over one hundred dollars.